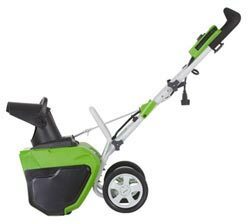 The Greenworks 20-Inch 12 Amp Electric Snow Thrower is an easy-to-use alternative to gas-powered snow throwers. Using a 12 amp motor, it clears a 20-inch path in snow up to 10 inches deep, and discharges snow up to 20 feet away. You can discharge snow in any direction with the 180-degree directional chute. An adjustable handle, 6-inch radial wheels, and a cord lock make this tool easy to use. This electric snow thrower does not put out carbon emissions. Electric snow thrower clears a 20-inch path in snow up to 10 inches deep. Using a 12 amp motor, the thrower clears a 20-inch path in snow up to 10 inches deep. It throws snow up to 20 feet away. A 180-degree directional chute allows you to direct the snow discharge wherever you'd like. The 6-inch radial wheels help you move easily through the snow. This snow thrower weighs 37 pounds. Because it's electric, there'll be no more wearing out your arm on a pull cord. Simply flip the switch and it turns on instantly. The snow thrower's adjustable rubber grip handle bar allows users to set its height at one of three positions to provide comfort, effectiveness, and safety. A cord lock holds the extension cord securely in place, so that you don't have to worry about the cord getting in the way. This electric snow thrower will save you money even as it helps preserve the environment. It does not release carbon emissions, making for an machine. 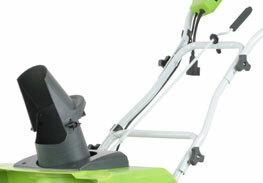 This Greenworks snow thrower is covered by a four-year warranty for normal home use. Snow thrower, discharge directional control, chute deflector, owner's manual, some assembly required. Within reach, the directional handle offers more control and better maneuvering when guiding snow. 6-inch wheels ensure effortless maneuverability. 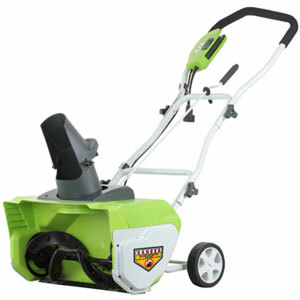 The dependable design of this Greenworks 20-inch 12 amp electric snow thrower will not let you down. With a clearing path of 20 inches and an 18-inch impeller, the snow thrower provides all the power you need to get the job done quickly and more efficiently. The thrower's adjustable chute and 6-inch rear wheels provide easier mobility for better control while the rubber molded steel auger breaks through hard snow and discharges up to 25 feet away.